I am super excited to show you how to make the creamiest hummus ever! 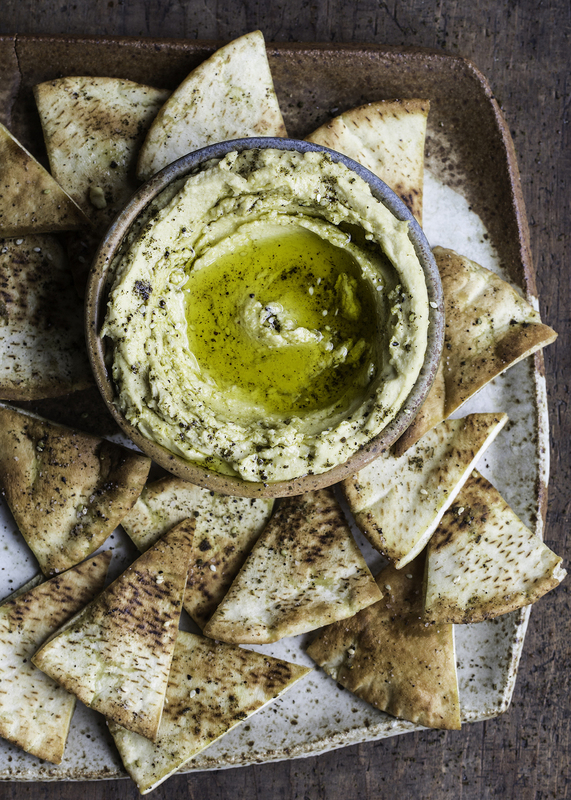 After just one try of my Homemade Hummus with Za’atar Pita Chips recipe, you will never go back to plain old hummus. The not-so-secret secret to creamy hummus is removing the skin from the outside of the chickpeas. The extra five minutes to remove the skin is totally worth the effort! It results in a really creamy hummus that is so delicious. To watch the process, click my YouTube video below! Pour the chickpeas into a large bowl and using your fingers carefully remove the clear skin front outside of each of the chickpeas. This will result in a much smoother hummus. Place the chickpeas, garlic, olive oil, tahini, lemon juice, salt, and pepper in the bowl of a food processor and blend until smooth. Transfer to a bowl and top with some olive oil and za’atar. Serve at room temperature along with pita chips. Preheat the oven to 375 degrees Fahrenheit. Cut each pita into 8 triangles. Place them in a single layer on a sheet pan and drizzle lightly with olive oil, za’atar, salt, and pepper. Bake for about 10 minutes, until crisp.